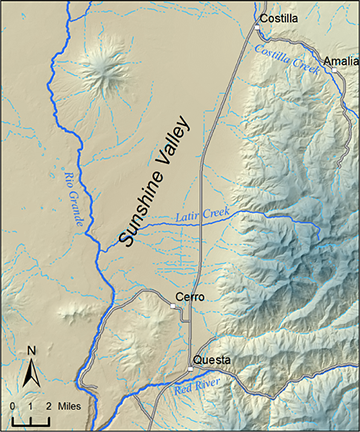 The AMP began a hydrogeology study of the Sunshine Valley in Fall 2017 with the goal to understand the sources of groundwater, where groundwater occurs, how it moves through the earth, and how groundwater is related to surface water. This information will benefit local residents, the State’s regulatory agencies, and the public, and will promote responsible decisions regarding the region’s water resources. Data collection includes hydrologic inventories at wells and springs, measurement of water levels in wells, sampling water for chemical analysis, and surveying with geophysical equipment. The data and interpretations will be presented in a report that will be publicly available on the internet. We will also prepare a report explaining the results for non-scientists. Funded by Healy Foundation, Aquifer Mapping Program and the Bureau of Geology.